The Real 'Favourite' Of Queen Anne's Era? Tea, And The Gossip That Swirled Around It : The Salt The Oscar-nominated film has reignited interest in the life (and love interests) of a corpulent, gouty, queen who liked chocolate more than tea. 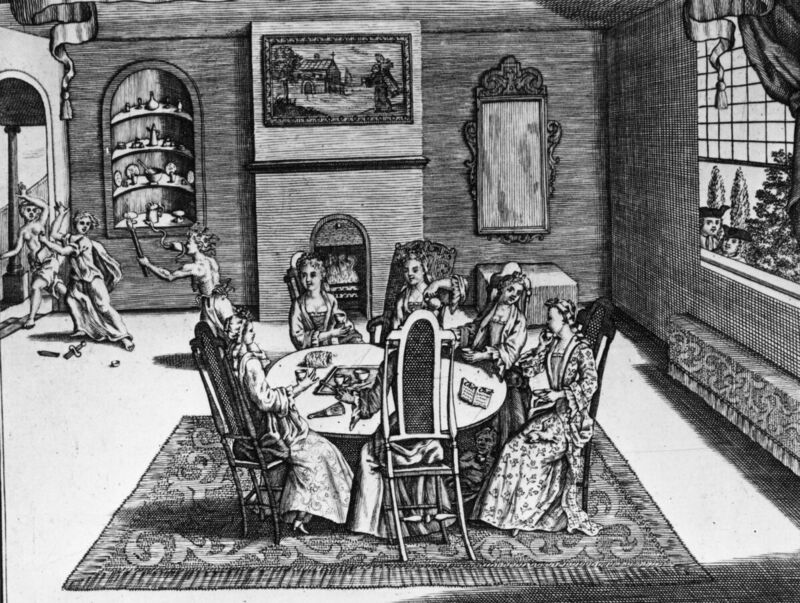 So why are Queen Anne and tea-drinking so closely tied? A satire of women's social discourse in the Queen Anne period depicts six women taking tea in a parlor, with figures on the left signifying hidden emotions and power struggles behind a genteel facade. Circa 1710. A film about Queen Anne of Great Britain, The Favourite, by the unorthodox Greek director Yorgos Lanthimos, will probably cadge a few Oscars. Even if it doesn't, this comic and oddly moving film has already achieved something extraordinary. 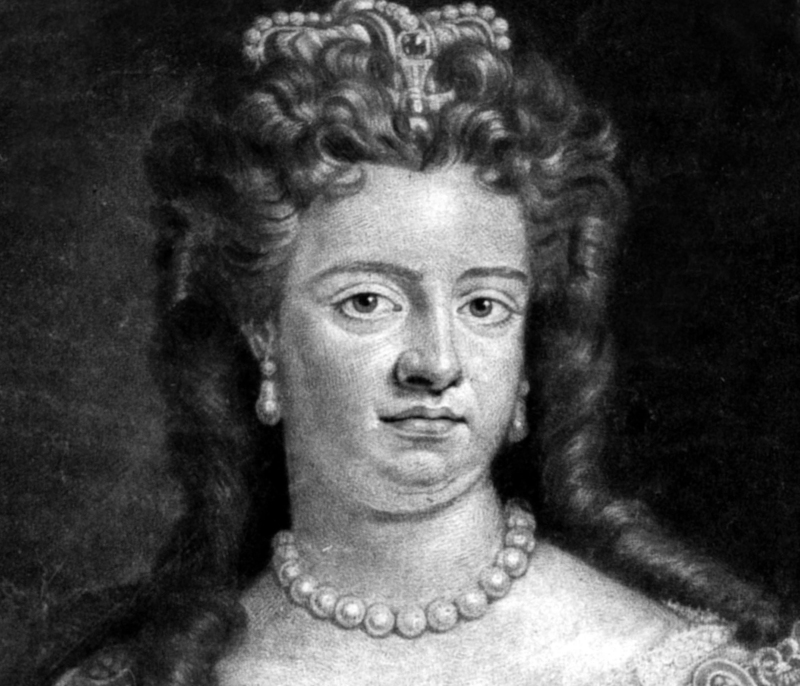 It has ignited widespread interest in the life of a corpulent, gouty, myopic, staunchly Anglican queen who allegedly had passionate relationships with two ladies of her bedchamber and who was pregnant 17 times but died childless before her 50th birthday about 300 years ago. That's an operatic biography, but strangely enough, until this movie, the only popular image the words "Queen Anne" triggered was of curved brown legs. Not the queen's gout-afflicted limbs that are a focal point of this raunchy film, but the classic, S-curved, cabriole legs that are a hallmark of Queen Anne furniture. Immensely popular across England and the American colonies, this elegant furniture was a fixture in wealthy 18th-century parlors from London to Boston. But why did this style of furniture, which constitutes Anne's most prominent cultural legacy, become such a rage? One of the chief reasons can be distilled into a dark and delicious word: tea. Queen Anne and tea have a curious relationship, embellished with more than one ironic twist. Personally, Anne did little to promote tea. She liked it and drank it, of course, but her sweet tooth made her crave the other modish drink of the time, chocolate, which she savored privately in her bedchamber before taking a nap. She didn't share the same relationship with tea. But the connection between tea-drinking and Anne's reign has been widely commemorated in furniture, poetry, painting, journalism, satire and even slang. Why? Good timing, is the answer. As tea historian Jane Pettigrew points out, Anne's reign (1702-1714) happened to coincide with an important time for tea. By the time she came to the throne, tea-drinking, which had been going on in England for about 40 years, had evolved into an exceedingly fashionable social ritual among the upper-classes, spurring an unquenchable demand for all kinds of accoutrements for this expensive and exotic drink — from fancy new tea equipage in silver and porcelain (that was imported from China as well as made locally) to especially designed tea furniture. In another happy coincidence, Anne's reign witnessed the rise of that perfect accompaniment to a cup of tea: the morning newspaper. The first British daily, The Daily Courant, was launched the year she came to power, while the celebrated upper-class gossip sheet, The Tatler, followed seven years later. What a delectable pairing it must have been, fantasized the historical writer Mrs. Oliphant, for the Tatler to be "served up with the foaming chocolate or fragrant tea at every breakfast in Mayfair." But first, those Queen Anne legs. Among the most popular pieces of Queen Anne furniture were those linked to tea-drinking, notably the tea table. Since coffeehouses were not considered respectable for ladies to frequent, and the establishment of woman-friendly tea gardens was still decades away, the tea table offered a genteel alternative: a convivial place to congregate, sip on Bohea and Hyson, and pass the time. It wasn't long before it was being lampooned in verse as the "chief seat of slander" where "at each Sip a Lady's Honour dies." Queen Anne's reign coincided with an important time for tea and the emergence of the tea table. "The first tea tables (explicitly so called) were sold in the late 1690s before Queen Anne's reign," says Markman Ellis, professor of 18th-century studies at the Queen Mary University of London. "But the idea of 'the tea table' as more than just a piece of furniture, but also a social event at which women and men met together for gossip and conversation, begins in Anne's reign especially." Of the tea tables, the tilt-top table, was the most sought after. So called for the nifty mechanism that allowed the top to be flipped up and flattened for easy storage, it had a central column with three cabriole legs that ended in pad feet or ball-and-claw feet. Not too big, but large enough to accommodate a tea service, it sometimes had a scalloped or pie-crust edge or a tray-like lip to prevent the spoons and bowls and other costly paraphernalia from clattering to the floor. Delicately ornamented and lacquered in a style called Japanning, its quiet elegance marked a departure from the baroque excesses of the time. Several paintings of the era capture scenes of families and friends gathered around these small, light tables drinking tea. Across the Atlantic, American landowners and merchants who took their cultural cues from England eagerly aspired to acquire these tables. Martha Washington owned one. Benjamin Franklin contemplated getting one for his sister as a wedding gift, before priggishly changing his mind and buying her a spinning wheel instead because, as he explained in his letter to her, "the character of a good housewife was far preferable to that of being only a pretty gentlewoman." Easy to reproduce, they were soon widely available. Indeed, it is impossible to browse through an antique store today without stubbing one's toe on a reproduction. "We see tilt-top tables very often," says Sebastian Clarke, a furniture expert and appraiser for the Antiques Roadshow on PBS. "They could be set out for tea, and once the social event was over, placed against the wall, as was the custom until the mid-part of the 18th century. Also known as occasional tables, they were used for gaming and meals as well as tea." Occasional table was only one of several names for this table that was also advertised as claw table, snap table, pillar and claw table, stand table, turn-up table, and most common of all, tea table. Very many names, except for one glaring omission: Queen Anne Table. And here's where this story takes an unforeseen twist. It turns out that the term "Queen Anne furniture" simply did not exist until almost 200 years after Anne's reign. "Queen Anne is a term used by 20th-century collectors of English and American antiques to refer to most fashionable furniture produced within the years 1720–1760," says Sarah Fayen Scarlett, American material culture scholar. 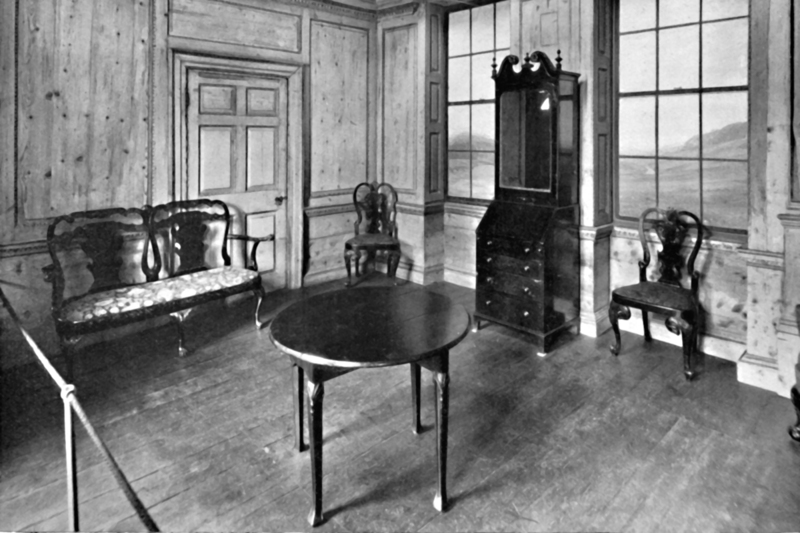 "When people began collecting and studying antique furniture in England and America in the late 19th century, they regarded these artifacts as markers of taste and culture, so using monarchical names (others include William and Mary Style and Georgian) connected these artifacts to known figures in the past. Much of what we call Queen Anne furniture doesn't even coincide with Queen Anne's reign!" Essentially, then, the imperial brand name "Queen Anne" was grandmothered in by collectors to identify a style of furniture that spanned a much wider period than the queen's brief reign. And that's how this overweight queen, who had to be carried to her coronation in a chair because of her lameness from gout, came to posthumously lend her name to a style of furniture whose most distinguished design element is its elegant legs. It's an irony that is both brutal and glorious, and more than anything else, in keeping with the scathingly funny tenor of Lanthimos' film. 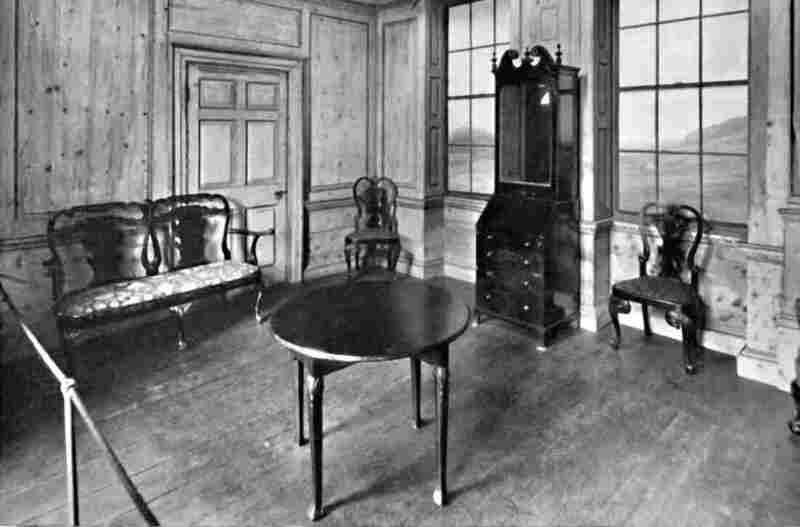 A paneled room, dated about 1740, containing furniture with the cabriole legs that are a hallmark of Queen Anne style. 1927. From Old Furniture, Volume I., edited by Lieut.-Col. E. F. Strange, C.B.E. In The Favourite, nursing the queen's inflamed legs gives chambermaid Abigail the opportunity to inveigle her way into the royal bedchamber, much to the chagrin of her powerful rival, the duchess of Marlborough. The two women scheme ruthlessly for the queen's bed and favor, their lives as enjoined as the three legs of a tea table, and hostilities come to a boil when Abigail slips a drug into the duchess's teacup — or tea bowl. While the poisoning is fictional and the sexual strife highly speculative, the cup itself (a small blue-and-white porcelain bowl with a deep saucer) is an authentic period prop, points out Ophelia Field, author of an authoritative history on the duchess of Marlborough, The Favourite. "Tea was drunk from handleless china bowls imported from the Far East, with the very first matching tea set introduced during Anne's reign," she tells NPR. "They also used silver 'mote spoons,' which had tiny holes for picking out tea leaves from the bowl before strainers were introduced. Serving tea was a significant performative part of conspicuous consumption, both at court and in those homes which imitated court fashions." Waiting to poke fun at all these affectations was the 18th-century writer Daniel Defoe, who sneered at "foolishly vain" tradesmen whose wives "sit above in the parlour, and receive visits, and drink tea," and "have their parlours set off with the tea-table and the chocolate-pot, and the silver coffee-pot," despite the steep taxes on all three drinks. Here thou, great Anna! whom three realms obey. Dost sometimes counsel take — and sometimes Tea. "These lines are usually thought to diminish the importance of the queen's counselors or her interest in politics," says professor Ellis, "but equally, it suggests that her morning tea table was an important part of her governing practice. Incidentally, Pope's rhyme suggests that tea was pronounced 'tay' in polite circles at this time." Polite circles had also coined a very impolite nickname for their queen. She was called Brandy Nan, for her alleged weakness for "cold tea." A euphemism for brandy in a teacup or brandy-spiked tea, the term is revealing of how this relatively new drink had already become part of court slang. But who can blame Brandy Nan for hitting the cold tea, if indeed she did? Short-changed by life and history, she was derided for being a weak, gluttonous, bibulous woman who, as one malicious ditty went, committed "dark deeds at night" with a "dirty chambermaid." Some of the charges are perhaps true. 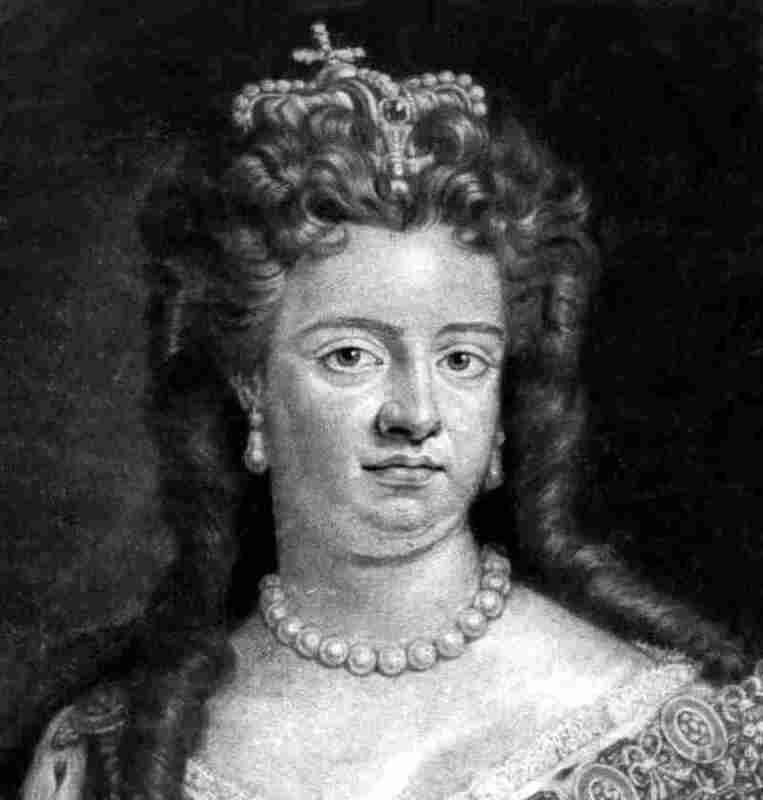 But Anne got no credit for the military and political triumphs of her reign or even the basic acknowledgment that despite her poor education, awful health, and the unimaginable sorrow of being permanently pregnant and eventually childless, she was a well-liked ruler driven by a strong sense of duty. The Favourite redresses some of this by portraying Anne with sympathy and humor, and by presenting the whole story in an ahistorical and thoroughly madcap manner. In effect, it gleefully tips up the preset, tilt-top tea table of history — handleless cups, mote spoons, teapot, urn, sugar tongs, slop bowls and all — and allows us to revel in the smashup. Great Anna might have relished it. Nina Martyris is a journalist based in Knoxville, Tenn. Tea Tuesdays is an occasional series exploring the science, history, culture and economics of this ancient brewed beverage.